Baking bread is an age old craft and adding flavour with fresh garden herbs makes it even more satisfying. There is not much that surpasses the aroma, taste and texture of bread warm from the oven. Adding fresh herbs to bread adds even more to the flavour and turns a basic loaf, flatbread or muffin into something of a signature dish. Herbs have always been used to flavour food, but one tends to see their use more in terms of roasts, slow cooked stews, soups, and other braised dishes. Baking benefits just as much from the individual and subtle flavouring that herbs provide. For those who love baking – and they are a specially gifted few – the herb garden offers a wealth of different flavours. There is the sweetness of anise or the spiciness of fennel seed, the fragrance of rosemary or lavender, the tang of chillies or the savory notes of thyme, oregano, marjoram and chives. As in other forms of cooking, herbs should not dominate but just enhance the taste. The more familiar one becomes with the taste of each herb, the more creative one can be in combining herbs that complement each other in flavour. The fresh herbs are added to the dry ingredients and should be chopped as finely as possible. Allow the freshly picked herbs to dry out for a day or so before chopping up. The chopped up herbs will not be as wet and will distribute more easily throughout the dough. Strip the leaves off the stems before chopping. Herbs that are still full of juice when chopped tend to form clumps and not mix easily. A quick way to finely chop the slightly dried herbs is to put them in a coffee grinder. Herbs can also be used on flat breads, focaccia etc as a topping and are then baked into the bread. They tend to sink into the bread which adds to the flavour. 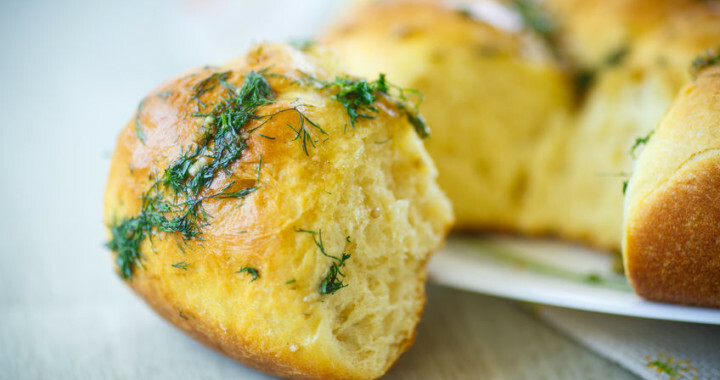 When using herbs in muffins or scones, don’t over mix the ingredients. Cut the butter or oil and liquids into the flour with a knife, rather than kneading it. For those still at the experimental stage, this list of herbs covers the different flavours and the herbs are easily available. Most are aromatic herbs that stand up to long cooking by retaining their flavour. An exception is basil which is regarded as a mild herb, in spite of its strong perfume. It can be used in muffins or savoury scones that require a short baking time in a hot oven. Rosemary (Rosmarinus officinalis is a very aromatic, shrubby perennial. Use only the leaves. A sprinkling of leaves together with coarse salt or olives is a delicious topping for focaccia or other flat bread. The leaves become crunchy and the flavour goes into the bread but is not too overpowering. Alternatively, grind a small amount of dried rosemary leaves for flavouring. Chives and Garlic Chives (Allium schoenoprasum) is a clump forming perennial that may die down in winter but regenerates and flowers in spring. It is one of those cut and come again herbs that adds a mild onion flavour. Using sharp kitchen scissors just snip the leaves finely into your bread or muffin mix. Italian Parsley (Petroselinumcrispumvar Italian) is a tastier and larger leafed version of the Parsley moss curled. It is a good companion herb to thyme, oregano or marjoram. Oregano (Oreganumvulgare) and Marjoram (Oreganummajorana) are both bushy perennial herbs. Oregano dries well and has a stronger taste when dry so should be used sparingly. Marjoram has a richer taste and can used as an alternative to marjoram. In addition to normal loaves, incorporate them into pizza dough or sprinkle on top before baking. Annual Dill (Anethumgraveolens) or perennial Fennel (Foeniculumvulgare)seed is spicy and can be used to flavour bread and biscuits. Collect the seeds at the end of the season and dry them. The finely ground seeds can be mixed with butter to make a tasty spread. Basil (Ocimumbasilicum) is a summer annual with an abundance of juicy, fragrant green leaves. A delicious combination is a basil and garlic French loaf. Even if you don’t bake your own, you can still claim the compliments. Chilli peppers (Capsicum) can be dried and ground and then added to the dry ingredients. The best drying peppers are cayenne and they are hot, but not overly so. Posted in Culinary, Growing Herbs and tagged baking, bread, culinary, flavour, herbs, spice.